Loadscan's CVS featured in Construction Equipment Guide - Loadscan featured in Earthmoving Equipment magazine - The low-down on compaction factors - Loadscan chosen to present at CIM Mining Convention - Spotlight on safety at Haulage & Loading conference - Loadscan's CVS featured in Australian Mining magazine - Taganito Mining NAC - Case Study - Revital Group, Cambridge New Zealand - Case Study - Learn how to maximise your payload with autonomous volume scanning at EXPOMIN - The value of volume - Find out how you can obtain accurate load measurement data, with a single drive-through scan, at SteinExpo (Germany) - Sell in volume - measure in volume - J McKinnon Development client testimonial - Banholzer AG Switzerland Visit - Loadscan - Volume scanner Construction Brisbane Australia - Case study - Loadscan featured in E&MJ - Tritton Copper Mine Australia - Case Study - Teranga Gold Senegal Africa - Case Study - Banholzer Lenk Switzerland - Case Study - J McKinnon Florida - Case Study - Ivetic Trucking Florida - Case Study - Hindustan Zinc, India - Case Study - Win an iPad! * - Keeping connected with the compost and mulch industry - Taking conveyor volume scanning to the world at WOA/AGG1 - Truck congestion at mine caused by weighbridge now solved with Loadscan - Loadscan launch new product - Load volume scanner not wasting a metre for Fulton Hogan - New Florida based Sales and Service Rep for Loadscan - Hindustan Zinc, India - Case Study - Proudly representing Loadscan at Mulch & Soil Council - Oceana Waihi Gold New Zealand - Case Study - Loadscan welcomes new Sales Manager - Laser precision - Loadscan's Carey West interviewed by Roads & Infrastructure magazine - Straight talking from Amerimulch - Loadscan featured in Australian Mining Magazine - Ivetic Trucking Florida - Case Study - Beach Contractors, Waihi Beach - Case Study - Loadscan's ExportNZ awards video - First look at Loadscan’s belt scanner at QuarryNZ - How to make invoicing easier for bulk materials - New law puts safe loading in the spotlight - Loadscan to exhibit at Queensland Mining Expo - Loadscan announced as finalist in Air New Zealand Cargo ExportNZ Awards - Daltons Matamata New Zealand - Case Study - Loadscan staff experience the ultimate free flight - Underground mining: How to measure and optimise each payload - Visit Loadscan at Canada's CIM Convention - Loadscan's advanced payload management technology at Steinexpo 2017 - Part two – real results from a Brisbane based construction company. - How to optimise the loading of your bulk landscaping products - Volumetric Load Scanning, Australia. - Tritton underground copper mine increases trucking factors with Loadscan - Road Metals Co Ltd Christchurch New Zealand - Case Study - All autonomous - Construction Brisbane Australia - Case Study - J McKinnon Florida - Case Study - Banholzer Lenk Switzerland - Case Study - Bin shape cause haulback? - Volume of bush material needed? No problem! - The facts and figures - real results from a Brisbane based construction company - Why it’s time to replace paper PLODS with a new technology - Why choose an LVS over scales? - Sakhalin Island Russia - Case Study - Stage 3 Separation Texas USA - Case Study - A&R Earthmovers Tauranga NZ - Case Study - Makies AG Zell Switzerland - Case Study - Gammans Tauranga New Zealand - Case Study - Midwest Trading Illinois USA - Case Study - Gro Bark Canada - Case Study - RichGro Western Australia - Case Study - ODOD Gold Mongolia - Case Study - Tritton Copper Mine Australia - Case Study - Teranga Gold Senegal Africa - Case Study - First solar powered LVS is a success at Teranga Gold - Sales team struck gold! - Civil construction company solves disputes over quantities delivered - Loadscan scales up to measure large rigid dumpers - On your mark, get set, go! Loadscan's competitive Christmas - Feeling short changed? 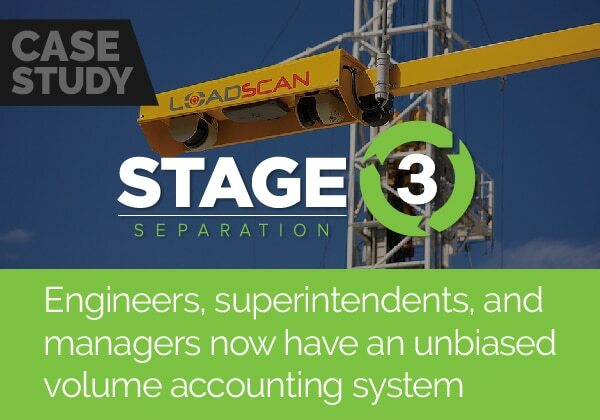 Three signs you’re being under-supplied - FBTA conference – find Loadscan at booth 201! - And the winner is... - Catch Loadscan at The World of Asphalt 2018 - Your chance to win a free 2-week Loadscan trial - Start off 2018 with a trucking factor increase of 15% - Scanner rental gets a big thumbs up - Saving by the bucket load - Get accurate volume measurement for bulk materials - Loadscan customers keep coming back - Successful first install - "LVS system is just as important as the truck!" - Smiles all round for new customers - from Kuwait to South Africa! - How to optimise the life of your truck tyres - Loadscan for sand mining - civil construction video - Measuring up to Gro Rich - Get accurate volume measurement for bulk materials - Loadscan’s innovative measurement solution provides accuracy where it counts. - Benefits of an LVS system in the quarry industry - a quick interview with Carey West - Gro-Bark invests in accuracy and reliability - The history of Loadscan - the original Load Volume Scanner - Learn to maximise your payload opportunity at AIMEX, Sydney - Keeping it in the Waikato - Mobile Scanner Install for Canada - Mobile Scanner Install for US - Loadscan's Customer Article - Loadscan Gaining Momentum - Loadscan Sales & Installs - Install for Major Compost Facility in USA - Success at ConExpo, 2017 - Loadscan Attends ConExpo, 2017! - Weight, volume, or both? Truck measures explained. - Makies AG Switzerland Installation - Supporting the Beautiful Beast - LoadScan at USCC Conference (Booth 608) - LoadScan Demo Site - Global Oil & Gas company conducts internal review - Compost: How load out operations impact profit - LoadScan increases its presence in Northern Hemisphere - Loadscan in Melbourne Construction Project - Article - Pit & Quarry Magazine August 2015 - 6 questions to ask when choosing a payload measure - Debris monitoring: Is there room for improvement? - New Quarry Mining Video | Load Volume Scanner - Loadscan In Action - WINNERS – 2016 Technology Release of the Year - Load Volume Scanner - First Scanners to USA - Short Changed? Three Signs You’re Being Under-Supplied - iSeekplant interview: Loadscan - A step-up in load measurement for Australia’s contracting industry. - LoadScan attends Hurricane Conference - LoadScan Releases MyScanner™ v2.1 - Testing for Pattern Approval Australia - Load Volume Scanners - Trade Legal Status Granted for Australia - LoadScan news roundup for 2013 - The compost conundrum - are you being short changed on supplied volumes?